Your Free Seat Is Reserved! Get lifetime access to all of the summit sessions, exclusive bonus sessions (that won't be part of the summit), my Resume Revamp course, and one-on-one career coaching. Save 33% by grabbing the Early Bird package before 10/16! Can't Make All Of The Live Events? The All Access Pass gives you lifetime, on-demand access to every single session. 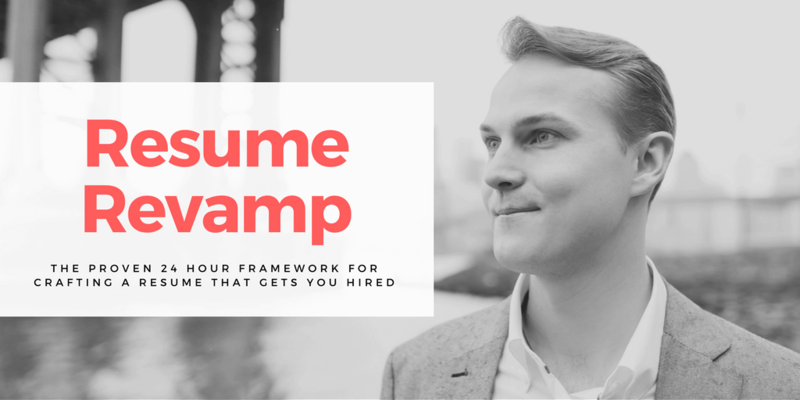 Discover my proven overnight framework that will allow you to effectively craft resumes that will actually get you hired. Revamp students have landed interviews at Google, Facebook, Apple, Amazon, Microsoft, and more. I normally charge $50 for the Resume Revamp course, but it's included with your All Access Pass! Land an exclusive, 30 minute one-on-one career coaching session with Austin. How To Correctly Answer "Tell Me About Yourself"
Sign Up Before The Summit Starts & Save 33%!